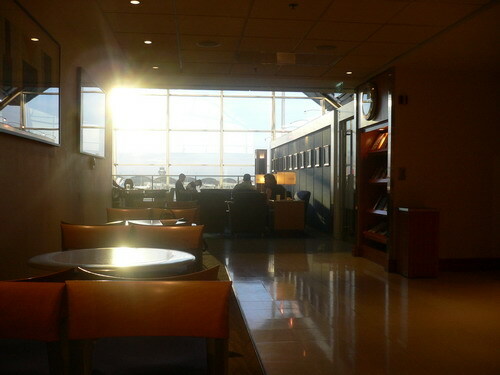 Right after passing through immigration and the first stage of security screening, I made a right turn and headed for the lounge to grab a light bite prior to boarding. It's the usual tomato juice, coffee, sandwiches and the newspaper. Immediately after the hustle and bustle of all the people jammed at the security screening, the walk towards the far side of the lounge plunges me into the deep ocean of quietness and calm. A good break to regain my sanity but only for that 1 hour before it's time to go back and head for the boarding gate to embark on my 5th trip to the US of the year. LittleDowager*: Actually, there are quiet sanctuaries everywhere. More often then not, we are so caught up with the hustle and bustle that we overlooked them. The Courtyard at Chijmes is a very good example. So is the ex-SJI, now Singapore Arts Museum. You should go check out the latter if you can find the time. sunflower: I wonder if anyone from Singapore heading to the US can share with us his/her recent experience at Changi Airport? sunflower: Hubby in US now? He left before or after the terror alert? ha, coincidently, he is supposed to traveling to Houston too. But he trip got cancelled due to other commitments. sunflower: I doubt if it is canceled. Probably just postponed to a later date. Keep us posted ok? ok. Hopefully, I can follow him. sunflower: Hopefully? What don't you just ask your hubby can or not? Need to hope one meh?